Jean Lichty and Larry Bull in Nora. Photo by Carol Rosegg. BOTTOM LINE: A short-and-sweet adaptation of A Doll’s House delights in the classic’s greatness while inviting a modern lens. Isn’t it lovely to become reacquainted with a well loved and still relevant theater classic in less than two hours? Any audience members familiar with A Doll’s House will not be disappointed by this one-act version of the play (unless you’re partial to the servants or the children, the only characters cut from the original). Nora focuses on the five central adult characters: Nora and Torvald Helmer (played by Jean Lichty and Todd Gearhart, respectively), Nora’s childhood friend, Christine Linde (played with beautiful nuance by Andrea Cirie), the Helmers’ misanthropic and sickly friend, Dr. Rank (played by the acclaimed George Morfogen), and a foreboding and “morally corrupt” Nils Krogstad (played sympathetically by Larry Bull). We still hear all the necessary exposition about Nora taking a loan without Torvald’s knowledge to pay for a restorative trip to Italy. We watch Krogstad, her loaner, threaten to ruin Nora and Torvald when he discovers Nora forged her father’s signature on the promissory note between then. We watch Nora turn to Christine and Dr. Rank for support and advice, and try to influence her sway over Torvald (perhaps with a little more credit to Nora’s cunning than one might find in the original). Nora still dances the tarantella, Torvald still condescends his wife with supposed kindness, and Torvald still lashes out at Nora for blemishing his home before quickly forgiving her when his reputation is restored. One revision does stand out: In Bergman’s adaptation, Nora and Torvald perform the famous breakup scene while Torvald is still naked (or in bedclothes, according to reviews of previous Nora productions worldwide) after making love to his wife earlier that night. He pleads to her like a helpless child while sitting wrapped in a bed sheet, and Nora stands over him, fully dressed, as a fully-realized woman and an adult in charge of her own life. This “chamber” version of Nora Helmer’s famous tale seems perfectly suited for the Cherry Lane Theatre: Both Nora and the small theater space in which it’s presented share intimate hominess, as well as impressive histories proceeding them. Harry Feiner’s scenic design capitalizes on this intimacy with a set that conflates the Helmers' parlor room and master bedroom, blending the Helmers' private and public lives together. The bed’s constant presence highlights the sexual undertones emphasized throughout Bergman’s adaptation. Feiner beautifully captures the play’s tone shifts through his lighting, which starts as a shadowy and antique-looking yellow palate, and by the end blooms into a bright and modern-looking white light coinciding with Nora’s enlightenment. Like the lighting, Ryan Rumery’s sound design invites a modern perspective on the classic story. Stirring and arrhythmic chimes complemented by synthesized melodies convey a dreamlike mood, like a historical memory told through contemporary soundscapes. As for costumes, certainly it’s hard to go wrong on a play that calls for period dress. On top of executing these gorgeous antique styles, Theresa Squire successfully conveys Nora’s internal shift as her increasingly more mature looks mark her entry into empowered womanhood. Director Austin Pendleton tips his hat to Bergman’s iconic cinematographic style in his staging, particularly during intimate conversations and confrontations where characters look right past each other. He also plays up the drama early by placing Christine and Krogstad at the forefront of our attention, as they gaze over Torvald and Nora forebodingly when they are not in a scene’s dialogue. They are like ghosts warning of the couple’s inevitable demise. Pendleton also utilizes poetic movement sequences and intriguing subtext to gave beautiful nuance to Nora’s story. While a few over-acted moments early in the play briefly broke Pendleton’s spell, for the most part the cast works well with his vision and were a joy to watch. There are a few jarring modern phrases that stick out in the updated text, but still, Bergman’s Nora is an enjoyable reminder of why Ibsen’s A Doll’s House remains a classic. It’s wonderful to see this English translation of Nora in NYC for the first time (it was first produced at the Pittsburgh Public Theatre), in order to experience the thrill of Ibsen’s play reborn. And watching the Cherry Lane’s production, a tasteful homage to Ibsen’s original with a modern lens, feels like catching up with an old, dear friend. 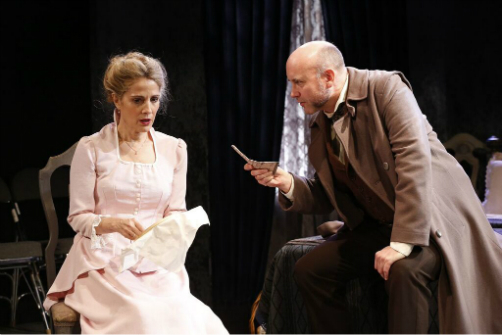 Nora is an adaptation of Henrik Ibsen’s A Doll’s House, written by Ingmar Bergman and directed by Austin Pendleton. English translation is by Frederick J. Marker and Lise Lone-Marker. It is produced by Cherry Lane Theatre and La Femme Theatre Productions. Set and lighting design is by Harry Feiner. Costume design is by Theresa Squire. Sound design is by Ryan Rumery. Wig design is by Paul Huntley. Dialect coach is Patricia Fletcher. Movement consultation by Shelley Senter. Production Stage Manager is Kelly Ice. Assistant Stage Manager is Denise Wilcox. The cast is Larry Bull, Andrea Cirie, Todd Gearhart, Jean Lichty, and George Morfogen.